Mission San Luis Rey de Francía. Courtesy of Santa Barbara Mission Archive-Library. Mission San Luis Rey, known as “King of The Missions”, because of its size, population and crop production, is number eighteen in the mission chain. Located on a hill overlooking a valley, San Luis Rey lies between Mission San Diego de Alcalá and Mission San Juan Capistrano. Although San Luis Rey was one of the last California missions founded, on June 13, 1798 by Father La Suén, it quickly became the most prosperous. Extending over six acres the population reached 2,869 in 1825, a size that is over three times the California mission average. 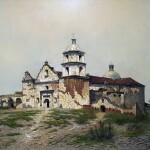 By 1830, the mission was the largest building in California. Named after Saint Louis IX, King of France and patron of the Secular Franciscan Order, San Luis Rey along with Mission Santa Barbara, is one of two missions that has always been Franciscan. The Franciscans continue to proudly serve at Mission San Luis Rey today, sharing a respect for life and the California environment just as the early mission founders did. The mission tour begins at la sala general, a regal room used as a meeting place and a place to receive visitors. In contracts to the ornate sala is the Friars bedroom. Completed in 1815, the church at San Luis Rey is the only surviving mission church built in a cruciform plan. The church is unique because of its wooden cupola and dome. The dome is built of pine wood and at the top light can easily enter. The reredos and the altar reflect both classical and baroque architecture. A stroll through the gardens reveals the remains of a carriage arch, which was the original entrance to the inner buildings of the mission. Looking through the arch lies a pepper tree, the first one in California, brought from Peru and planted at the mission in 1830. From I-5: Exit to CA-76 East. Turn left onto Rancho del Oro. Cross Mission Street to the mission parking lot. 9:30a - 5p Monday-Friday. 10a - 5pm Saturday - Sunday. Please call 760-757-3651 to confirm.